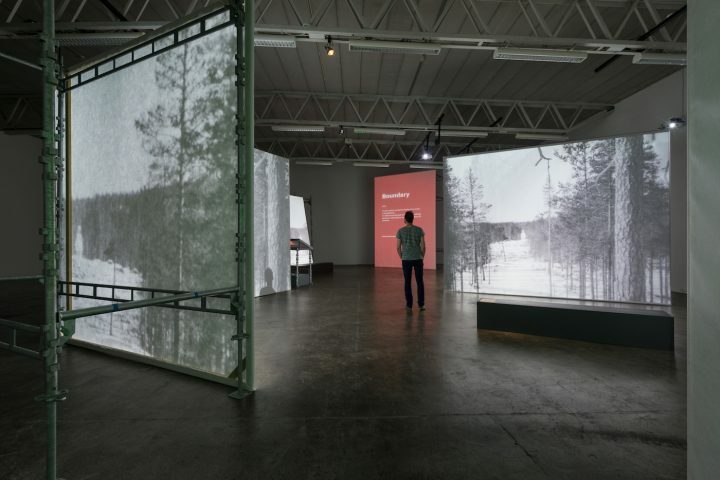 MOSS, Norway — A museum located inside of a kunsthall folded into a larger biennial, Laura Gustafsson and Terike Haapoja’s project for Momentum 9 is a multilayered institutional critique. 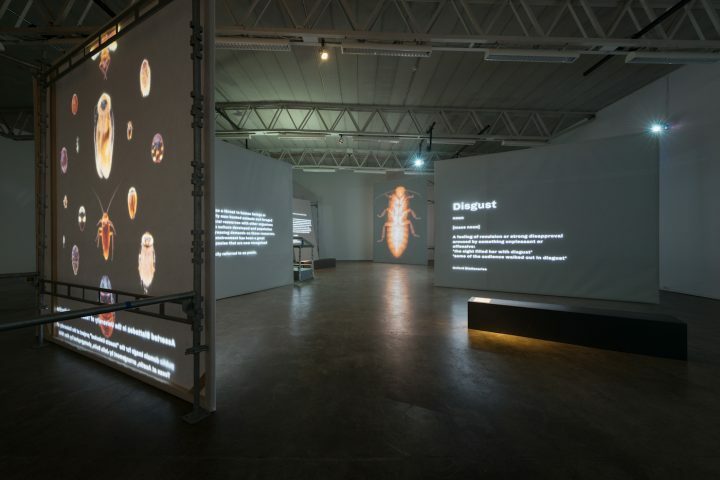 Their Museum of Nonhumanity, on view at the Nordic Biennial of Contemporary Art in Moss, Norway, attempts to undermine the Western, colonial, patriarchal thinking that leads to systems of oppression, as well as the cultural centers complicit in othering, or drawing distinctions between different groups. A tall order indeed. The museum comprises scaffolding and screens instead of walls, underscoring its temporary, unfinished quality (“being dismantled, under construction,” as Haapoja describes it to me). Their exhibition medium is primarily language itself. 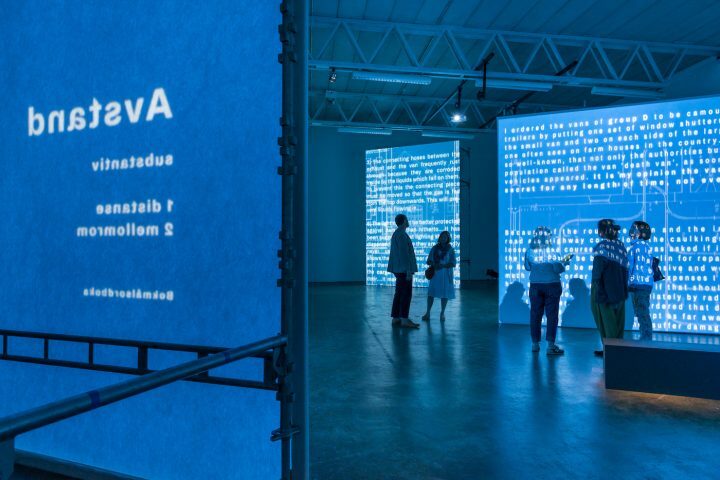 Throughout a 70-minute performance, archival texts, images, and dictionary entries in Norwegian and English flash on the screens mounted around the deep, dark room on the second floor of the Momentum kunsthall. Meticulously arranged, the material all relates to 14 different themes, beginning with “person” and ending with “display.” Melancholy music, heavy on violin, emanates from the ceiling. During three of the themes (“resource,” “boundary,” and “anima”), visitors can also listen to audio material with headphones placed on benches around the staggered screens. Around the back, more typical history museum fare awaits, including stuffed animals and the Norwegian constitution. These all come from nearby institutions, grounding the peripatetic work in a specific local culture. Gustafsson and Haapoja present their language without comment. Watching stark, bold text regarding the Dred Scott case (the law labeling American slaves as three-fifths of a person), rules about animal experimentation, and the definition of the word “tender” flit across the monochromatic screens, the audience begins to analyze juxtapositions, gaps, and relevance among the assorted ideas. Depending on time of entry and duration of stay, viewers will experience the language and trajectory differently. The underlying idea — that language shapes dehumanization and othering — becomes quickly apparent. The subtle pleasure of viewing comes from gradually grasping the nuances of this process in a reflective atmosphere. Though the pair originally considered building a massive installation of physical items to present their themes, they decided to focus instead on language, which, though immaterial, has shaped many of the world’s structures. Gustafsson and Haapoja first launched the roving museum in Finland, where they also held seminars about gender equality, empathy, and animal rights and set up a vegan café. The duo envisions the museum as a kind of utopia, “an imaginary institution in a world where there’s no more dehumanization,” says Gustafsson. In Moss, they will similarly organize site-specific programming. In June, they opened an edition in Santarcangelo, Italy, as part of a larger city festival. They’re currently in conversation with stateside organizations about bringing the project to the US. Their itinerant museum has the capacity to reach international audiences while addressing local concerns — a rare, democratic feat. They’ll also preserve the project through a book they’re publishing, featuring their source material, images of the installation, and essays. As I viewed the work, I began considering just how “nonhuman” each element was, as though there was some kind of hierarchy. Wolves seem more nonhuman to me than embryos, which are certainly less human than Rwandan men and women. While this kind of categorization and labeling contributes to the kind of detrimental othering that leads to civil war, colonialism, and enslavement, it also bolsters the pro-choice cause and decisions to test potentially life-saving drugs on mice. Watching the displayed text leads to uncomfortable revelations about viewers’ own values, prejudices, and hypocrisies and asks us to reconsider the merit of certain categorizations over others. The final section, “display,” includes Encyclopedia Britannica’s definition of “natural history and natural science museums.” The “natural world” it describes notably omits humans, while its undemocratic underpinnings are clear in the final line: “These museums have their origins in the cabinets of curiosities built up by prominent individuals in Europe during the Renaissance and Enlightenment.” For hundreds of years, the wealthy elite have been dictating what we can and can’t see, designating what will be preserved for posterity. As the Oxford Dictionary definition of “spectator” crosses the screen (“a person who watches at a show, game, or other event”), the work addresses its viewer, asking us to consider our own position to the themes explored. 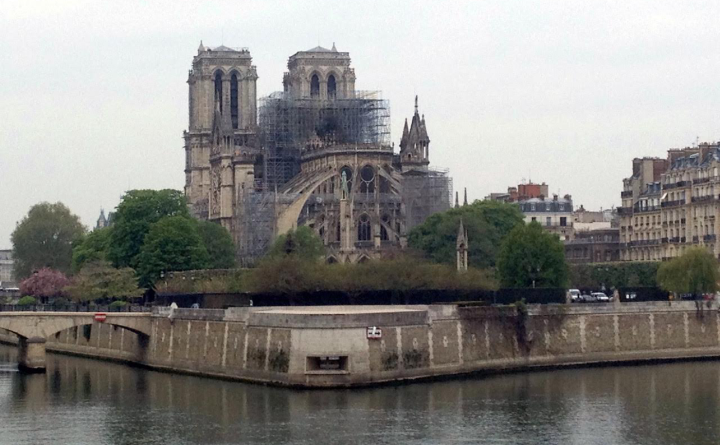 Are we merely receiving language and recycling it, or are we actively questioning it and the structures it produces? Ditto for the way we consume museum offerings — both objects and text. 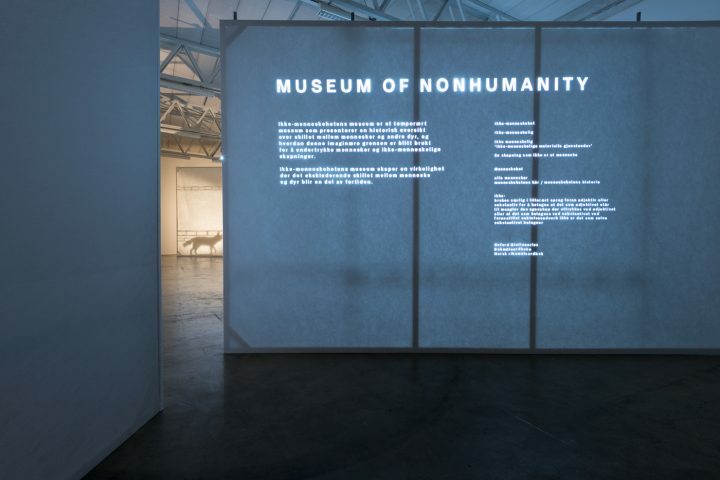 If the Museum of Nonhumanity promotes a healthy rejection of elite institutional culture, it also advocates for greater acceptance of the sentient world around us. Critiquing power structures is nothing new, but Haapoja and Gustafsson are offering a powerful, physical, and very real alternative. Walk out of their exhibition and you may feel more skeptical of the biennial format and the framework that financially supports it. More than that, you might feel a greater connection to the life around you, outside the museum. Haapoja describes the xenophobia currently plaguing Scandinavia: a “specific kind of racism that comes from not being exposed to any difference.” Worldwide, populism increasingly trumps acceptance. As far as museum takeaways go, a unifying and consideration-inducing sentiment can sound a little ethereal and mawkish, but the Museum of Nonhumanity’s graceful, understated choreography makes it seem like just what we need. Museum of Nonhumanity continues at Momentum 9 (Momentum Kunsthall, Henrik Gernersgate 8, N-1530, Moss) through October 11.